Did you know, entry to many of Lincoln's and surrounding area's attractions and activities will be free of charge during Discover Lincolnshire Weekend from 12th to 13th of March. In support of the weekend, Longdales House will be offering book one night Bed & Breakfast and get one free. Over the Christmas season and as part of Lincoln's Magna Carta 800th anniversary celebrations, businesses across the city will be displaying their own mini festive baron. Look out in window displays and at till points of shops, bars, restaurants, estate agents, and other businesses around Lincoln to find a whole host of individually painted baron statues. The statues are a nod to the popular Lincoln Barons' Charter Trail that, over the summer, raised more than £167,000 for The Trussell Trust as part of the city's Magna Carta 800th anniversary celebrations. Post photos of your favourite mini festive barons on the Facebook event page for the chance to win prizes and special offers from businesses in Lincoln. You can buy your own mini-baron to paint and decorate at home from Lincoln Visitor Information Centre at £9.95 each. They make a perfect Christmas present too - a great reminder of the trail over the summer and Magna Carta's 800th anniversary in 2015. So the auction of the Lincoln Barons took place the other evening and a whopping £167,000 was raised for the Trussel Trust. What a great outcome. Hopefully the Baron's will still be able to be seen in their new homes. Just had some great news. Our colleagues in The Venue cinema, just across the car park from us, are screening "Ed Sheeran - Jumpers for Goalposts" on Thursday 22nd October. This special cinema event, including red carpet highlights, an exclusive live performance from Ed and the film shown in its entirety for the first time, will be beamed via satellite live from London’s Leicester Square. What's more - we've still got a few rooms left for that night, so if you fancy having a drink in The Venue bar & then staying over after the screening, why not check out the availability that's left for that night. Well - the Baron's have gone off the streets of Lincoln! We had a great time visiting them all with our grandson & completing the Barons' Trail. You can still see them en masse at Lincoln Castle from 24th to 29th September - go to http://www.visitlincoln.com/whats-on/lincoln-barons-reunion to find out more. We can't wait to see what's next for the streets of Lincoln!! The city of Lincoln was founded by Roman invaders in the 3rd century and many Roman remains can still be seen today. Find them yourself using Visit Lincoln's digital Roman Trail. 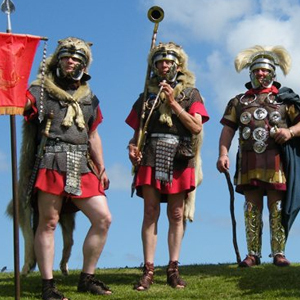 Or you can meet the Roman army for yourself on September 19th and 20th as they set up camp at Lincoln Castle for the weekend. Lincoln BIG (the Business Improvement Group for Lincoln) celebrated 20 years of Town Centre Management and 10 years of Lincoln BIG itself yesterday. The organisation manages the city centre and surroundings, providing a safe, wonderful and vibrant city centre for our guests to enjoy when they stay with us. Along with the appearance of the city (hanging baskets, signs, etc), they also organise a wide range of events throughout the year, including farmers' markets, craft fairs, the Lincoln Ice Rink, the Lincoln By The Sea summer event plus a host of others. So why not visit us in Lincoln and see for yourself just what a great historic city it is. What a great way to spend a weekend - celebrating 1940's Britain with a day of activities on Lincoln's famous Brayford Waterfront. With fantastic "living history" items such as a display of wartime Blitz fire-engines and some great wartime music, the event promises to be a superb day out. It all takes place on Sunday 23rd August, and it culminates with a flypast by the Avro Lancaster from the Battle of Britain Memorial Flight. Well worth booking your stay with us ready to make the most of the weekend. I was talking to some of our guests the other day about their stay and they remarked that Refectory, our on-campus eatery where we serve breakfast, was a great place to meet people and enjoy good food. So....I thought that I'd add a few words about it. Refectory is right next door to Longdales House and is generally open from first thing in the morning until late afternoon. As well as serving scrumptious breakfasts, a range of hot and cold food is offered throughout the day - you can get a really tasty jacket potato with a choice of toppings for less than £3. The Refectory team also take great care of how they craft individual coffees making them some of the best (and the least expensive) around! So, if you're staying with us (or even if you're not) it's always well worthwhile popping into Refectory to see what's on offer. Lincoln Castle is the place to be over the weekend of August 8th and 9th with a great re-telling and re-enactment of the story of King Stephen's capture. This truly memorable experience will feature realistic combat and terrifying stunts. PUNCH & JUDY IN LINCOLN!